The bat caves are approximately 30kms from Mbeya and extend deep into the limestone rocks - bring a torch. Seasonal bat colonies, incorporating six different bat species can be seen streaming out of the cave at dusk. There are also several natural hot springs lower down the valley and several lime kilns dotted around the area. Located 65 kms South East of Mbeya, towards the Zambian border. 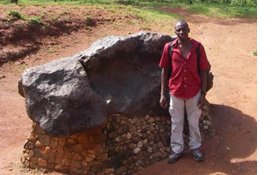 It is the seventh largest meteorite in the world and weight approx 15 tonnes. The "Bridge of God" (Daraja la Mungu) is just outside the town of Tukuyu, South of Mbeya. Nearby is the Kijungu waterfall. Other attractions include Kaporogwe falls, the World's End viewpoint looking out across the Usungu Flats, Loleza Peak, the market village of Masoko. The quite wilderness areas around Lake Rukwa to the North (the largest lake to lie entirely within Tanzania's borders) have large concentrations of hippo, crocodile and bird life.